Hey there, everyone!! So, I am light nighting it...and just finished taking some images of this cute Love Me card set! I used up a bunch of my scraps and a few more full sheets of my 6x6 Love Me pad from My Mind's Eye, and used up the majority of the fun matching diecuts as well! Instructions: Make card from vintage cream cardstock. Cut grey doily paper slightly smaller, and adhere to the card front. Layer a heart doily to the right side. Cut a banner edge to a block of love paper, and adhere to the middle. Fussy cut a banner, and adhere it to the upper left corner. Zig-zag stitch along the fussy cut banner, and the right side of the love paper block. Stamp the sentiment across the top of the hearts. Diecut the circle & heart from vintage cream cardstock and pink felt. Stamp the inside of the circle, adhere the felt to the center and then adhere in place of the "O" in LOVE. Thread three buttons with twine, and adhere below the stamped sentiment. Accent with pearls to finish. My next card is all about sending sweet love notes and letters! I loved this cute little mailbox diecut from MME, and it matched perfectly with these PTI stamps! Instructions: Make card from vintage cream cardstock. Cut love paper slightly smaller, and adhere to the front. Cut a block of striped paper, add a pinked edge to the top of it and adhere to the middle. Stitch along the top of the striped paper. 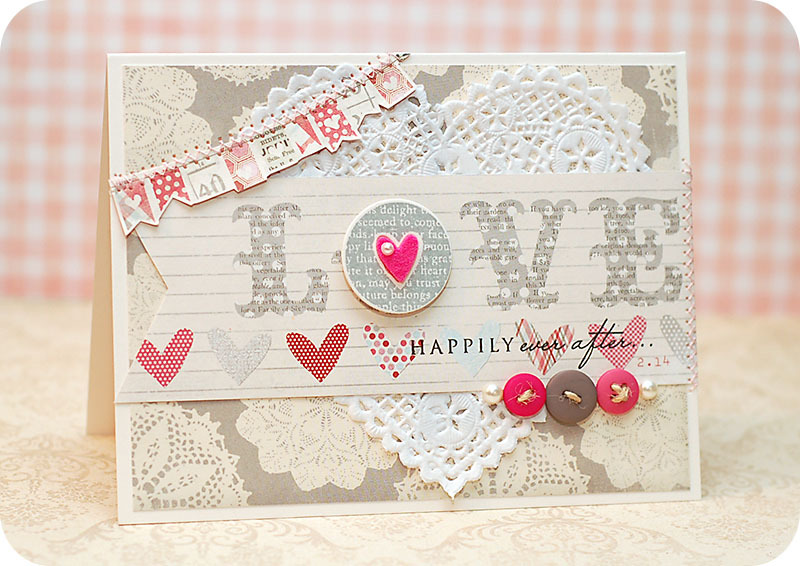 Stamp the letters to vintage cream cardstock, color the top letter, and then cut out. Cut a line in the top of the diecut mailbox, then adhere the stamped letters into it. Diecut a tag from vintage cream cardstock, then stamp the sentiment to it. Wrap twine around the stamped letters, adhere the tag to the twine, then top with a twine bow. Add a blue jewel to the bow, and a red heart jewel to the center. Adhere the entire mailbox to the card front. Add the honeycomb border to the bottom of the mailbox, and stamp the two teeny sentiments to it. Accent the lower right corner of the striped paper with jewels to finish. For my third card, I just went a little bit crazy layering! Lots of circles layered here and there, along with other diecuts as well!! Instructions: Make card from vintage cream cardstock. Cut numbered paper slightly smaller, then adhere to the front. Adhere a red doily to the middle. Diecut a scalloped circle from doily paper, and adhere to the middle. Fold ribbon as shown, and adhere across the scalloped circle. Fussy cut a doily from matching paper, then diecut a circle from vintage cream cardstock. Layer together, and adhere to the scalloped circle with foam adhesive. Layer together the love diecut with the circle & heart diecuts, then zig-zag stitch along the top seam. Adhere the entire piece to the circle, then accent with pearls. Cut a banner edge to pink paper, stamp the sentiment to it and adhere to a heart topped pin. Stick the pin into the paper, then add a twine bow to the bottom of it. Adhere a diecut banner across the top of the card to finish. And last, but definitely not least...a card that's design is based completely around using that fun bingo card diecut! Not to mention...lots of other diecuts and fussy cut banners! Instructions: Make card from vintage cream cardstock. Cut vintage paper slightly smaller, then adhere the bingo card diecut to the middle. Cut a strip of vellum, add a strip of glitter to the bottom, then wrap around the bottom of the card. Wrap ribbon from the top to the bottom and secure in place. Tie buttons around the top and bottom pieces of ribbon, then adhere the entire paper block to the card front. Stamp the sentiment to the vellum strip, then accent with jewels. Fussy cut the banners, and adhere to the top & bottom of the card. Layer together the diecuts shown on the left, and stitch a fussy cut banner to the bottom of it. Adhere the entire diecut piece to the upper left corner to finish. Beautiful creations once again. Loving that they are all very similar in colour combo's, but yet each one is so unique. Wow these cards are all simply stunning. Just love what you've done with that MME paper pad. It's such a versatile collection isn't it? 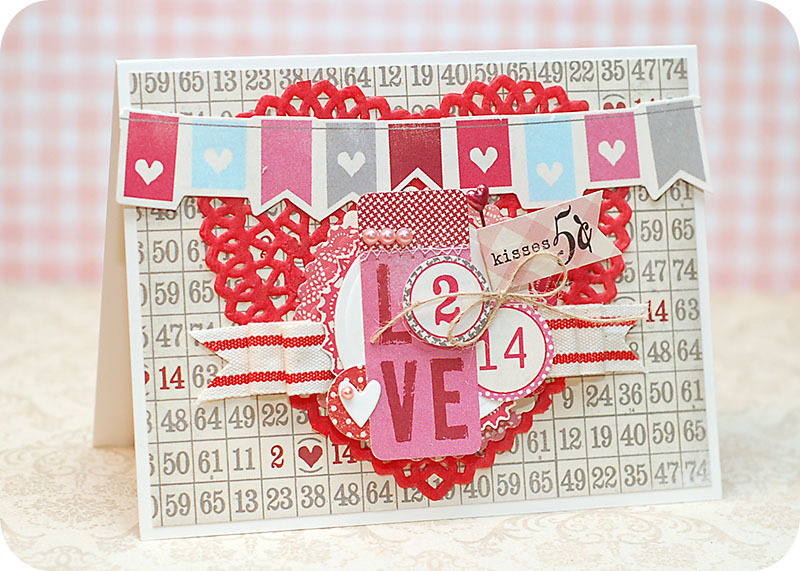 Thanks for playing along with us this week over on the Daring Cardmakers blog. Beautiful card! Love the pps and design. Thanks for playing along with our CropStop Challenge Blog. My WOW's just kept getting bigger as I moved from project to project! Wonderful designs! Thanks so much for joining us at Friendship's Garden. WOW! You've been busy!! These are all fabulous! Thanks so much for joining us at The Sisterhood ‘VALENTINE’ challenge and please come back again soon! Love all the cards. Thanks so much for playing along on FOr Fun!! Lea, all four cards could have been entered in our challenge, the first card is my fave, just beautiful! Thanks for joining us at the Papercraft Star challenge this week! Absolutly beautiful and shabby cards, all four of them!! Thanks for joining my chllenge over at The Cupcake Craft Challenge this week! Good Luck! Hugs and sunshine! Beautiful cards!! Thank you for joining Stamp with Fun this week. ALL of these are simply beautiful! Love the second one with the heart gem on it. All are perfect Valentine's. Thanks so much for joining Belli Challenges. ...I'm questioning myself right now as to why I never bought any heart doilies! :) Fabulous designs! Gorgeous cards - so clean & fresh looking! Love all the detail!! Thakd for joining us at Friendships GArden! What a gorgeous set of cards!!!! I love them!!! Thanks for playing with us at CropStop!! Awesome set of cards with the lovely papers and color combo. Great work on the details. Pretty! WOWEE! I love them all. The banner on the first card is fantastic and that little mail box is too sweet. 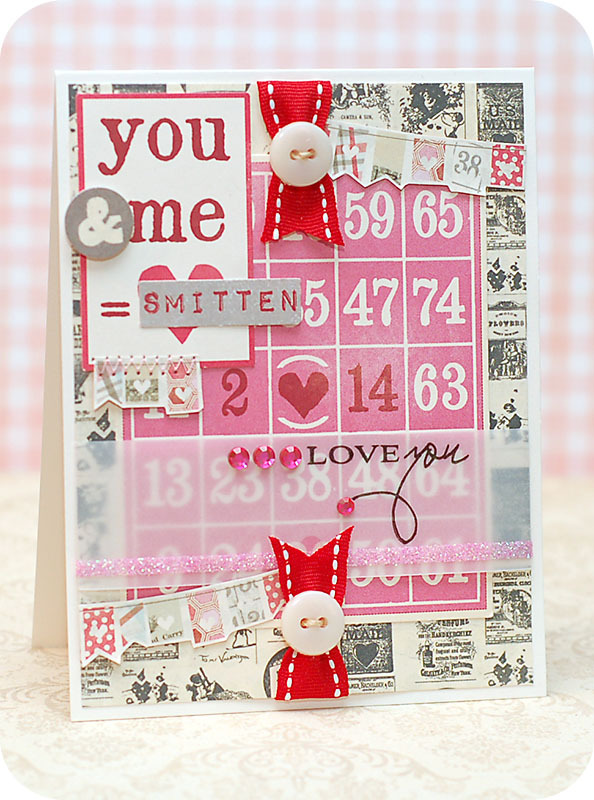 All of the dimension on your cards is fabulous =) Thanks for playing along with The Sisterhood of Crafters for our Valentine's Challenge! Wow..these cards are ALL gorgeous!! I LOVE them all (pun intended)! Thanks for joining us at Frosted Designs!! All these cards are gorgeous, love your designs and layers! Thanks for joining our Valentines challenge at Friendship's Garden, hope to see you next time too! OMG, love them all! I have this paper, now I'm off to case some cards! Thanks for playing along with Fab N Funky this week! Love the cards! Looking so chic! Fabulous cards ♥ Thank you for joining the Daring Cardmakers this week.